Past the time for those terrible resolutions and January 17th which is the most common date to give up on them! So now is a great time for positivity. Look ahead to what could be and what can be - for yourself and for others. To all you Statesiders eagarly awaiting the new season of Downton Abbey, the finale didn't disappoint - I have to admit to a little tear! 5 ways to hide Tummy Fat and the way I do it! However slim you are if you're a Curvy lady, then you can always expect to have a slightly rounded tummy. Getting a bit of a 'pot', whether it's a little or a lot, is a natural part of being female - and it can be caused by losing muscle tone, childbirth, weight gain, natural ageing or just being allergic to exercise like me! There's always weight training or boot camp but it's certainly easier to disguise! Choose shapes carefully and there are lots of ways to hide your tummy. Laid myself on the line here ladies - I've got a bit of a 'pot', so see how I get around it! Like to be the first to review my Ebook? how to choose makeup, hair tones, underwear etc. Wow! Not only is there a lot of information and lots of pictures but it also comes with a 45 shade print ready Color Swatch. I'd love 10 people to help me please: 1 of each COOL, WARM, LIGHT, DEEP, BRIGHT and MUTED; SPRING, SUMMER, AUTUMN and WINTER. If you'd like to be part of my Review Panel please tell me your name and how you discovered your Color Family and I'll get back to you as soon as possible. Thank you so much. It's easy to get excited about a Color Swatch and then pretty soon begin to panic. Certainly, the Cool color palette is pretty special and very wide but until you clarify your basic (almost boring) neutral shades, it's impossible to begin any kind of color co-ordination. Discover how to choose and use the Cool neutral tones to use as Wardrobe Essentials. They'll form the backbone of every outfit and provide the perfect backdrop for all your crisp and vibrant COOL colors. 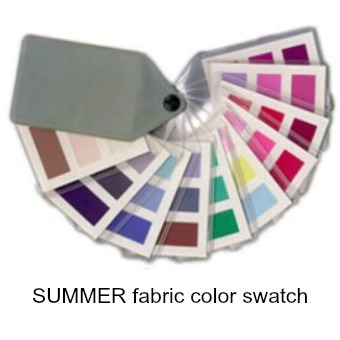 Bring your Color Swatch to Life - Kettlewell Colours 50% off SALE - but Hurry! Do you struggle to find your own colors? Have you discovered Kettlewell Colours? Well now's the chance to try some of these fabulous jersey separates and dresses as many items have 50% off. Every color shade in every Color Swatch comes to LIFE! Your Style Question of the Month - Color Analysis - 2 different results! 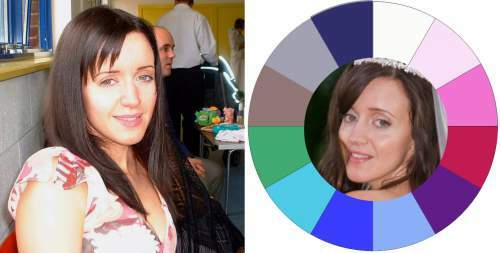 QUESTION: I have had my colours done by two different consultants. The first consultant said I was a cool summer, and the second a clear spring, so I do feel confused to which season I fall into? Cerie knew her skin was pink toned but because she felt there was some brown in her eyes, thought that she should be wearing Warm tones - hence adding red to her hair. It was a delight to be able to point out that her eyes were almost identical in color to those of Kate, Duchess of Cambridge and there's no doubt that her Color Family is COOL. 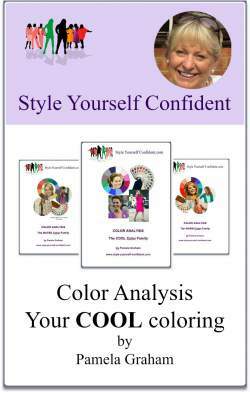 If you're unsure about the colors to make you look good and feel good try Online Color Analysis.